Sometimes in life we are given two stark options, it seems. Either A) decide to accept an event as a wildly unlikely coincidence, or B) consider the possibility that something/one might actually be at work in, oh I don't know, the unfolding of said events. Even as a Christian Pastor, it often times can take a lot to jar me out of A and in to B. The following story did just that. Two quick introductory remarks. First, the ethos of the church that my wife and I co-founded (Sojourn Grace Collective) has been shaped in no small way by author/blogger/warrior Glennon Doyle Melton. Her insistence on living life Brave (because we are children of God) and Kind (because, well, everyone else is a child of God, too) not only make up the wording of our weekly Benediction on Sunday mornings, but her general spirit of truth-telling, and people-loving, and grace-oozing inspires our community on the weekly. Second, the setting of this story was in Phoenix, AZ last week where Christianity 21 (C21) was held, a conference designed to bring together 21 voices from across the spectrum of Christianity to speak to where the church is heading (or ought head) in the 21st Century. Together with my buddy Mathew (who shared his C21 reflections on my blog Wednesday) we soaked up the goodness of the week, including of course a session by Glennon herself, our church God-mother (hope she doesn't mind being called thus, ha!). So I invited our people to, if they were going to write a letter to themselves, end it with those words from Glennon, "Whatever. I'm fabulous anyway." To help symbolize the letting go of these people from the cages we lock them in, cages of some debt we think they owe us (aka, forgiveness), I put a box up by the communion table where we could all leave our letters behind, then move toward the Bread and the Wine and fill up the hole we just left in our hearts, the ones caused by letting someone go, with the best hole-filler I know of: the Grace of God. After the service I announced to the church that Mathew and I were heading west to C21, and that my plan was take this box full of letters, this beautiful tangible sign of a faith-community choosing the path of forgiveness, with us to Phoenix. And while there we would be mindful for an opportunity, a moment, to dispose of the letters for good. When the conference ended the first day, Mathew and I hopped in our rental car and started driving back to the hotel. (Now, I'm about to briefly recount a series of events that verges on tedious, but there's a point. Hang in there.) Midway to the hotel I changed my mind on needing a jacket so we turned back around and drove up north a couple miles to a coffee shop where the conference was hosting an open mic night. After parking and briefly surveying the scene we decided it wasn't something we were interested in, so back to the car we went. In the parking lot we spent several minutes perusing our phones looking for a possible movie to check out, but at 9:25 at night our options were limited. Giving up, we resigned to return to the hotel several miles away. En route I stopped for gas where, after filling up our car, this white SUV came stumbling towards the pumps. Out hops a man who laments that he almost made it, and proceeds to ask us to help him push his car around the parking lot to a pump. We do. We push. Then back in the car, continuing to the hotel. After parking in the back of the parking lot we head toward the side-door of the hotel, the easier more convenient entry point to our room. However, I make an abrupt turn and say, "let's head around through the lobby, in case anyone from the conference is hanging out in the lobby" (a strange thing for this introvert to say). So we do, and lo and behold, there unpacking her stuff is Heatherlynn and her husband Jason! Heatherlynn was the musician who provided live music at C21, and Mathew and I enjoyed about 10 minutes worth of conversation in the lobby before turning to head to towards our room for the night. As I swivel around I see the back of this tiny framed women, all dressed in her jammies and barefoot, at the counter trying to work out something with the hotel clerk. There was Glennon, by herself, who just happened to walk down to the lobby at the exact same moment that we were passing through. Since I missed an opportunity to try and connect with her earlier in the day at the conference, I meandered over and smiled/waved at her. When she finished her phone call (with Sister, obvs) she warmly smiled (obvs, again) and her, Mathew and myself enjoyed a few minutes of conversation that included the conference, influence, Rob Bell, recovery, and hotel selfies. Mathew, Glennon and I, in the Hotel Lobby. Not wanting to prevent her from crashing for the night, I attempted to let her go, but not before sharing one last thing. I told her about the box of letters in our trunk. I told her about how much she has unknowingly shaped the values and culture of Sojourn. I told her about "Whatever. I'm fabulous anyway." And, in true Glennon style, her eyes lit up, her smile shone, and she exuded an energy of gratitude and love. I was relatively content at that point. I mean, come on, what a cool moment already! But Glennon, upon hearing of the existence of this box of letters, turns and says, "wait, you have them here? Now? Let's go burn them! Right now, in the parking lot!" What happened next was a series of rapid brainstorming as we looked for garbage cans, metal buckets, and lighters. But our senses suggested we not burn anything inside the hotel. The clerk overheard us and offered us a box of matches and told us about an ash tray outside (I don't think she fully understood what we were aiming to do, however. Thankfully). We walk outside and it wasn't just an "ashtray," it was a giant stone urn. Mathew picks up this 100 pound urn and the three of us walk to the back of the parking lot towards our car, 10:30 at night, one of us still jammied and barefoot. We set the urn down behind the car, hoping to avoid security cameras I guess, and pop the trunk to retrieve the box of letters. The next five minutes were had-to-be-there magical as we lit at first just one letter on fire, intending to just make a photo-op of it to send back to our church. 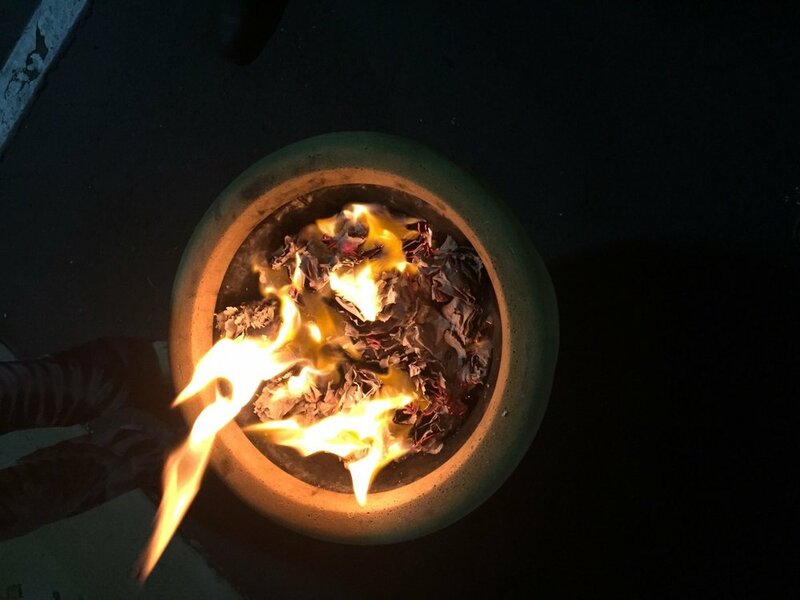 Glennon and I, together burning a letter of forgiveness. But you guys, this ashtray/urn was so big, it begged us to keep going. To feed it. To be the place of final release for so many people's wounds. So one by one we dropped these letters, these incredible gestures of people choosing the posture of forgiveness, these beautiful symbols of people believing that releasing people from cages of resentment and bitterness is truly the path to peace, these letters of people relaxing toward themselves and accepting their own fabulousness... now being consumed by flame, in a hotel ash tray, in the back parking lot, alongside Glennon Doyle Melton, after a chance-meeting-in-the-lobby that was remarkably preceded by a series of fortunate events. Coincidence? Sure, I suppose that's one way to receive the events that night. It just seems, oh I don't know, ungrateful to receive it that way. Like being the recipient of this incredible birthday present from a close friend who knows you better than you know yourself, and you think, "wow, they got so lucky that they just happened to pick out the exact thing that I love!" Instead, even though it rubs up against my unstable (and at times uncertain) Metaphysics, I choose to receive the events that night as a gift. I choose to receive it with a posture of gratitude and humility that maybe, just maybe, there are forces and energies at work in this world that might actually be interested in unlocking spontaneous moments of beauty right in front of our eyes. And if we would just be mindful about being mindful, if we would have eyes to see and ears to hear, if we would be open to the possibility that this Energy is always moving and ever seeking to break in to this world in surprising and life-giving ways, then perhaps we might just find ourselves in a back parking lot burning things with some pretty incredible people. I only wish I, too, was barefoot like Glennon. Because the ground that night was holy. Glennon, I just want to say on behalf of our community at Sojourn Grace Collective, thank you. Thank you for being you, for being fearless, for being inspiring, and for being present. Thank you for taking a few moments with Mathew and me in the lobby, and even more thank you for being awesome and crazy enough to go burn stuff with us. That was easily one of the highlights for me of the whole conference. Sincerely, the Brave and Kind in San Diego.